During our last stocktaking we identified the following products, all of which are unused but having been counted several times are not now in new condition. Each item is offered with a guarantee and will be run and tested in our workshop prior to despatch. VAT must be added to all prices. HURRY, when there gone ..........there gone. All of these spares are genuine Stuart Turner spares, new and unused but having been on our shelves for a considerable time are "shop soiled" with age. 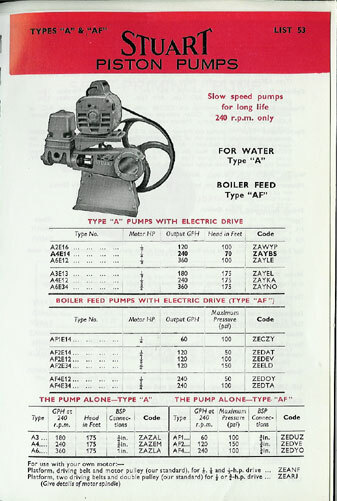 Back in the 1970's and 80's the "A" type pumps were the mainstay of our business being used on many Farms in Cornwall pumping water for the dairy and farmhouse. Now centrifugal pumps have replaced them but thanks to the many Rallies they can be seen working again. In compiling all lists on this page we have tried to be as accurate as possible with our description and parts lists, however due to the age of the items they may have been put into bins with wrong numbers over the years and we ask for your patience. Low speed lubricated gland packing and leather piston cups are part of our normal stock range. Hydram spares are also part of our normal stock range. 1 off 713-14200 Non-return Valve Body (used, but serviceable) 2" Heavy Duty offers? 1 off 716-10220 Inspection Cover (used, but serviceable) 3" offers?